Huntsville is the largest town in the Muskoka Region of Ontario, Canada. You'll explore the less-touristy side of things at Circling Hawks Centre and Sir Sam's Ski & Bike. Get in touch with nature at Arrowhead Provincial Park and Haliburton Nordic Trails. Get out of town with these interesting Huntsville side-trips: Rich Hill Candles and Gifts (in Bracebridge), Georgian Nordic Ski and Canoe Club (in Parry Sound) and Yummies in a Jar (in Baysville). And it doesn't end there: relax in the rural setting at Sugarbush Hill Maple Farm, look for gifts at Maple Bluff Farm, and take in the exciting artwork at The Screaming Heads of Midlothian. To see reviews, photos, where to stay, and more tourist information, read Huntsville attractions planner . Castries, St. Lucia to Huntsville is an approximately 13-hour flight. The time zone difference moving from Atlantic Standard Time to Eastern Standard Time is minus 1 hour. Expect much colder temperatures when traveling from Castries in December; daily highs in Huntsville reach -2°C and lows reach -11°C. Finish up your sightseeing early on the 13th (Thu) so you can go by car to Toronto. Escape the urban bustle at Niagara Parks Butterfly Conservatory and Journey Behind the Falls. Venture out of the city with trips to Niagara Falls (Horseshoe Falls & Niagara Falls). Next up on the itinerary: hunt for treasures at St. Lawrence Market, take in panoramic vistas at CN Tower, and appreciate the extensive heritage of The Distillery District. Plan trip to Toronto with our itinerary maker to find out where to go and what to do. You can drive from Huntsville to Toronto in 3 hours. Alternatively, you can take a bus; or do a combination of bus and flight. Traveling from Huntsville in December, things will get a bit warmer in Toronto: highs are around 2°C and lows about -3°C. Finish up your sightseeing early on the 16th (Sun) so you can travel to Ingonish. Head to Glass Artisans Gallery and Piper Pewter Inc.for plenty of shopping. Get outdoors at Cape Breton Highlands National Park and Ski Tuonela. Explore the numerous day-trip ideas around Ingonish: Indian Brook (Leather Works by Jolene & Colouratura Art Gallery) and Margaree Harbour Craft & Gift Shop (in Margaree Harbour). It doesn't end there: kick back and relax at Black Brook Beach and take a memorable drive along Cabot Trail. For more things to do, where to stay, and other tourist information, use the Ingonish driving holiday planner . Do a combination of flight and car from Toronto to Ingonish in 6 hours. Alternatively, you can drive; or do a combination of train, bus, and taxi. You'll lose 1 hour traveling from Toronto to Ingonish due to the time zone difference. December in Ingonish sees daily highs of 2°C and lows of -5°C at night. Wrap up your sightseeing on the 20th (Thu) early enough to travel to Mahone Bay. Mahone Bay is a town located on the northwest shore of Mahone Bay along the South Shore of Nova Scotia in Lunenburg County.HistoryMahone Bay was first settled during Father Le Loutre's War. Head to Have A Yarn and The Dog Shop Bathhouse & Boutiquefor plenty of shopping. You'll discover tucked-away gems like The Teazer and Suttles & Seawinds. Get out of town with these interesting Mahone Bay side-trips: Hirtle's Beach (in Rose Bay), Rissers Beach Provincial Park (in Petite Riviere) and Crescent Beach (in Lunenburg). There's still lots to do: stop by Haskapa. To see other places to visit, maps, where to stay, and more tourist information, you can read our Mahone Bay travel route planner. Use the Route module to find suitable travel options from Ingonish to Mahone Bay. In December, daily temperatures in Mahone Bay can reach 5°C, while at night they dip to -1°C. Finish your sightseeing early on the 23rd (Sun) to allow enough time to travel to Charlottetown. The largest city on Prince Edward Island, Charlottetown remains small enough for easy exploration on foot. Give yourself a bit of retail therapy at GJDE Gift Emporium and Sara Bonnyman Pottery. Get outdoors at Ski Wentworth and Northumberland Links Golf Club. You'll find plenty of places to visit near Charlottetown: Greenwich Interpretation Centre (in Saint Peters Bay), Northport Beach Provincial Park (in Northport) and Lismore Sheep Farm Wool Shop (in River John). There's more to do: stop by PEI Seaglass Shanty. To see maps, where to stay, more things to do, and more tourist information, go to the Charlottetown online visit planner . Getting from Mahone Bay to Charlottetown by car takes about 4.5 hours. Traveling from Mahone Bay in December, expect Charlottetown to be slightly colder, temps between 0°C and -7°C. Wrap up your sightseeing on the 27th (Thu) to allow time to travel to Whistler. Step off the beaten path and head to Backcountry Snowcats Ltd and Olives On Tap. Visiting Whistler Blackcomb and Black Tusk Trail will get you outdoors. Next up on the itinerary: look for gifts at Oracle Emporium at Whistler, soothe aching muscles at some of the top local wellness centers, and explore the activities along Lost Lake. Plan trip to Whistler with our itinerary maker to find out where to go and what to do. Fly from Charlottetown to Whistler in 11 hours. Alternatively, you can drive; or do a combination of bus and train. The time zone changes from Atlantic Standard Time to Pacific Standard Time, which is usually a -4 hour difference. December in Whistler sees daily highs of 0°C and lows of -6°C at night. Cap off your sightseeing on the 31st (Mon) early enough to travel to Tofino. Head to Dockside Smoked Fish Store and Image West Giftsfor some retail therapy. Step out of the city life by going to Long Beach and Chesterman Beach. Go for a jaunt from Tofino to Ucluelet to see Wild Pacific Trail about 38 minutes away. 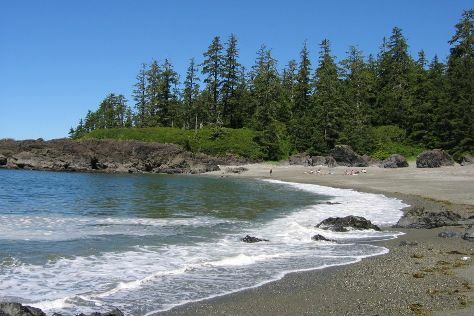 Spend the 2nd (Wed) exploring nature at Pacific Rim National Park. Next up on the itinerary: trek along Rainforest Trail, look for gifts at House of Himwitsa, tour the pleasant surroundings at Florencia Bay, and see majestic marine mammals with a dolphin and whale watching tour. For traveler tips, ratings, other places to visit, and other tourist information, use the Tofino trip builder site . Getting from Whistler to Tofino by combination of car and ferry takes about 6.5 hours. Other options: do a combination of bus and flight; or do a combination of bus and ferry. Traveling from Whistler in January, you will find days in Tofino are somewhat warmer (9°C), and nights are about the same (-1°C). Cap off your sightseeing on the 4th (Fri) early enough to travel to Jasper National Park. For shopping fun, head to Friends of Jasper National Park or Candy Bears' Lair. Step out of the city life by going to Maligne Lake and Athabasca Glacier. Next up on the itinerary: fly down the slopes at Marmot Basin Ski Area, stroll through Mount Edith Cavell Trail, take your sightseeing to a higher altitude at Whistlers Peak, and explore the stunning scenery at Sunwapta Falls. To see maps, more things to do, reviews, and tourist information, go to the Jasper National Park online travel route planner . You can do a combination of flight and bus from Tofino to Jasper National Park in 12 hours. Other options are to do a combination of car and ferry; or do a combination of bus and flight. The time zone changes from Pacific Standard Time (PST) to Mountain Standard Time (MST), which is usually a 1 hour difference. Traveling from Tofino in January, expect nights in Jasper National Park to be colder, around -15°C, while days are little chillier, around -1°C. Wrap up your sightseeing on the 8th (Tue) to allow time to take a shuttle to Banff National Park. Take a break from the city and head to The Lake Louise Ski Resort and Nature & Wildlife Tours. There's lots more to do: explore the activities along Moraine Lake, stop by Wilsons Mountain Sports, take in breathtaking views at Johnston Canyon, and cruise along Bow Valley Parkway. To find other places to visit, reviews, maps, and more tourist information, read our Banff National Park trip itinerary maker app . Traveling by shuttle from Jasper National Park to Banff National Park takes 3 hours. Alternatively, you can drive. Traveling from Jasper National Park in January, you will find days in Banff National Park are little chillier (-7°C), and nights are about the same (-16°C). Finish your sightseeing early on the 12th (Sat) to allow enough time to travel back home.